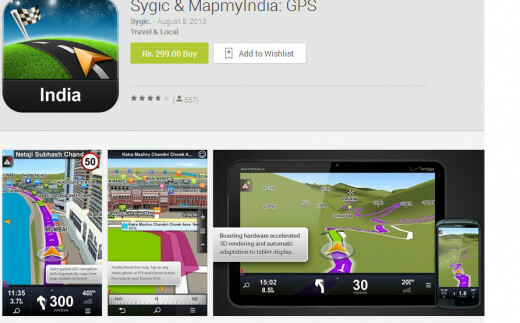 Sygic is the application which works as offline navigation without the internet connection. It works on GPS only. So it is very useful application when you travel outside. It is not always feasible to have internet connected to your mobile. In such cases, it is highly required to have the cheap navigation system in your hand. Sygic solves the same purpose. I have used it for around 3 months & I am satisfied with the performance & price of it. Free Trial version of it available for 7 days. You can download the map data for your state or any other state as per need. It is easy to switch the mode from 2D to 3D & from 3D to 2D. In a 3D view, you can see good graphics for buildings with proper dimension & color. Voice guidance is available in the different language. If you are traveling to the new country then Sygic will provide the basic information of that country like the speed limit for different types of road, country code. You can also see the popular places or tourist places easily. Graphics for 3D is much more attractive. It will show you the flyover and side road. It will provide you the lane assistance, which is very much useful. For route planning, it has three as mode as comes with standard navigation system like shorted, fasted & economic.You can also share your location, event if you want. While driving it will show you different parameter, which is mentioned below. It works on GPS connection only. No need to have working internet plan. I bought it in only 199 rs only. it means hardly 3.5$. Region & States Map data can be downloaded as & when required. City Guide & Emergence Help. Sometimes in very dense area GPS signal is not available & Navigation will not work. GPS signal will not be available inside the home. So you can not do route planning ahead of starting the actual journey. Lagging position display while navigating is active. Because of that sometimes it is difficult to judge the street while taking turn in multicrossing location. Rerouting will take a bit time unlike Google maps. Need to Enter precise address for destination. search result is not as good as Google location search results. 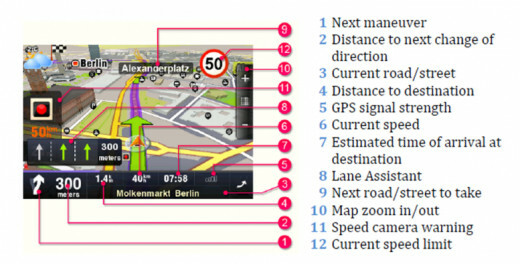 Route can not be calculated until GPS signal strength is good enough to calculate the route. Application require minimum 5MB of memory to start. So if you have memory issue with your phone then it will not start before you clear memory. You need to download the Sygic application from Google Play. Read the review before download. Once you install the application it will ask you to download the map data. Download the map data for the state in which you are living or you want to travel. Now start / Run the Sygic Application. search for the destination address. Go to search button on left side bottom side of Display. Type the address, location details to get the search result. Identify & Verify the address by means of "Show on Map". Select "Wait for Valid Position"
Go to Options-> Route-> Add Via Point. You will get three options. It will contain historical data of travel location with date & time. You can set Notification for different activity which can be useful while traveling or navigating. Select the respective setting & choose your selection. How to enable GPSin Sygic? Go to setting in phone, then move to location services & Enable GPS setellites.